These two decided to get married on their trip, just before leaving home they said…. lets do this! 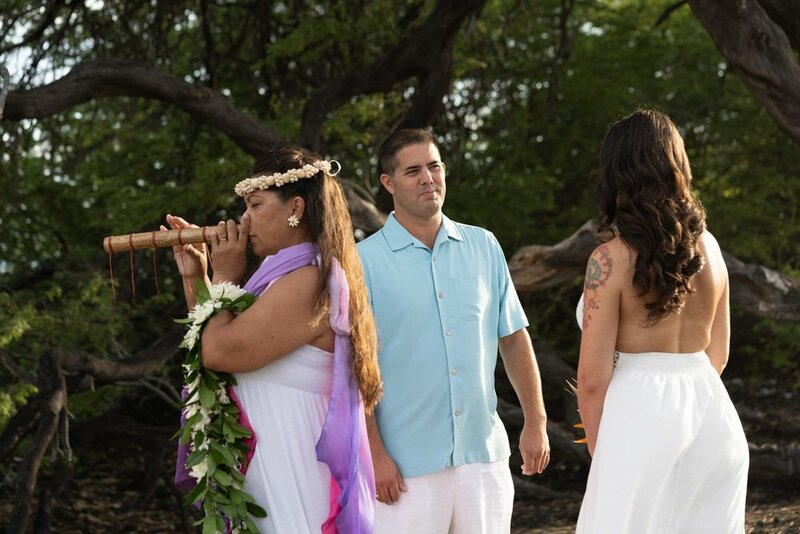 The officiant, Michaela Larson, began their ceremony with he blowing of the pu (conch shell) and a song from the nose flute. She continued some Hawaiian traditions including lei exchange and salt cleansing. The groom gave the bride his grandmothers ring and the couple were married right before sunset. The groom’s two sons were not on the trip with the couple, so they laminated their photos, put them on sticks and stood them in the sand so the kids their wedding party. I finished their photos then went on to my next job as hula dancer at the Kona Tap RooM. The couple was so sweet that they came to watch me perform on stage after they had dinner. I had noticed during the wedding ceremony that the ocean tide had changed dramatically so I thought… it might be a new moon and asked them if they would like to run out and try a starscape photo since they were still dressed in their wedding attire at 10:30pm. We went outside and sure enough it was a new moon! Even though there was a little cloud cover on the horizon the stars were still very visible and made for a unique image that can be captured only once a month and in their case once in a lifetime on their wedding day. I always love working with adventurous wedding couples who are up for trying something unconventional.